Sweet headline, right? About 5 percent clever, 95 percent annoying? Felt appropriate for a blog post about Notre Dame. Let me put on my Seinfeld cap on for a moment ($3.99, J.C. Penney’s online bargain bin) and ask an important question — WHAT’S the deal — with Notre Dame? I mean, come on, nine wins in a row? A Top 20 ranking? Wins over Syracuse and Marquette and Louisville, and second place in the Big East? I haven’t seen an Irish streak like this since Ted Kennedy drank 33 straight gins in ’62 to spite his brothers! Man, why do I always get so dark when I’m wearing my Seinfeld cap? Sorry. Let’s put it behind us. About six weeks ago, the only thing I knew about Notre Dame was that they’d lost a lot of games, and they seemed to have a rule where at least three starters must look exactly like former Irish star Luke Harangody. Seriously, look at this side-by-side picture of current forward Jack Cooley and Harangody, and tell me this wasn’t done on purpose. I wish I could tell you it ended there, but that’s just the tip of the iceberg. Guard Scott Martin looks like their goofy kid brother, Pat Connaughton is the sinister cousin, Tom Knight is the oafish cousin, and Patrick Crowley is the malnourished neighborhood kid who follows them around on a bike with a rickety front wheel. I’m not trying to insult anyone here. All I’m saying is that I saw these dudes wearing overalls in a community theater production of Oklahoma! last winter in Indiana. They were extras in the barn dance scene, and they were hilarious. But then, through some miracle, Notre Dame won. That game remains Syracuse’s only loss of the season, and at the time it felt an awful lot like a fluke. But four straight wins over quality Big East opponents, all of them at least on the tourney bubble — Seton Hall, UConn, Marquette, West Virginia — shone a new light on the Irish. Mike Brey’s squad was clearly legitimate, and now, after four more wins, they’re one of the hottest teams in the country and the odds-on favorite to take the 2-seed in the Big East tournament. How did it all happen, and what’s next? 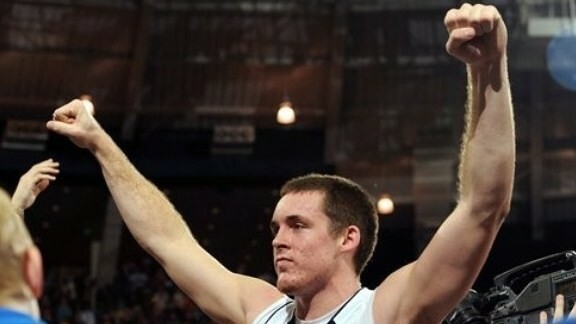 First, let’s talk about Brey. He came to Notre Dame in 2000, inheriting a team that hadn’t made the NCAA tournament since Digger Phelps was still coaching in 1990. But Brey flipped the script in a hurry. In the past decade, he’s led the Irish to seven tournament berths, with another on the way. His team has won 20 games in nine of his 12 seasons, and they’ve finished above .500 in the Big East all but twice. He even won a divisional conference championship in his first year, though the best he’s done since is second place. That’s the good news. The bad news is that the Irish have yet to reach even a Big East tournament final under Brey, and aside from a Sweet 16 appearance in 2003, they haven’t advanced past the second round of the NCAA tournament. In other words, Brey’s impressive (and fairly immediate) elevation of the Notre Dame program still awaits the next step. He’s watched stars like Harangody and Ben Hansbrough pass through the program without overcoming that obstacle, and there’s always a fear that the best chance has already vanished. For the past three seasons, the Irish have played incredibly slow. Their average tempo is 326th in the country this year, and it’s tempting to guess that the tournament woes come as a result of this strategic quirk. We see the parallel in teams like Wisconsin, which excels in the regular season with a snail’s tempo, but has trouble surviving late into the tournament. But Brey hasn’t always played slow — from 2007-09, Notre Dame was one of the faster teams in the country, and still the postseason results were the same. In three of the seven tournament losses under Brey, Notre Dame has lost to a higher seed. The latest example came last season, when the 2nd-seeded Irish fell to 10-seed Florida State, an admittedly brutal second round match-up. But whether a talent deficit or bad luck or some other element are to blame for the postseason woes, they’ve underachieved. Brey’s legacy will depend on whether he can shed that reputation as his career continues, and this year presents another great chance as the Irish peak at the perfect moment. It’s a cruel measure in some ways. Truth be told, this might be Brey’s best regular-season coaching performance yet. After losing his best player, Tim Abromaitis, to an ACL injury in November, Notre Dame’s chances of making the tournament, much less beating teams like Syracuse and Marquette, seemed dim. But the Irish had a streak in them, and it might last right to the end of the season. Here’s the quick profile of this year’s club: Notre Dame is strong on defense, holding opponents to a low effective field goal percentage and keeping them off the line at the ninth-best rate in the country. They don’t force a ton of turnovers, but that doesn’t hurt their efficiency. 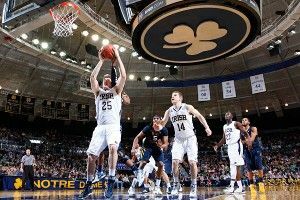 Offense is where the Irish truly excel, with the 29th adjusted efficiency in Division I. The only thing they do superlatively well is avoid turnovers, and the only thing they do poorly is crash the offensive boards. But with an overall competence in every other area, the whole is greater than the sum of its parts. Since Abromaitis went down, Notre Dame has responded. Sophomore Jerian Grant leads their balanced scoring attack with 13.1 points per game, while Atkins (13.0) and Cooley (12.2, and 9.2 rebounds) are close behind. But six players are averaging at least seven points per game, so if this team lacks a true star, maybe it’s because it doesn’t need one. There’s one very difficult road game remaining on the Irish schedule, this coming Monday at Georgetown. After that, the real test begins, at Madison Square Garden and beyond. Brey has proved his regular season coaching abilities yet again, but after a decade of bittersweet endings, Irish fans will expect more in 2012. Fair or not, those are the Irish terms.